Mark MacLean is a writer, editor and teacher who lives in Lightning Ridge, New South Wales, Australia. His book A Year Down the Drain, based on his popular blog about his exploration of Newcastle’s stormwater drains, became a surprise bestseller in 2013. The stories in his collection The New Landscape drew upon his time living in locations as diverse as Cumbria, where he grew up, and Alice Springs, where he lived for several years and worked as the publisher at an Aboriginal adult education college. 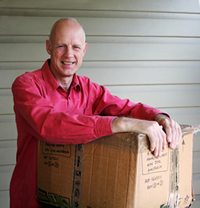 His memoir Five Boxes (published in Australia and the UK) looks at our connection to the past through our possessions. Five Boxes won the Zeferelli's People's Choice category of the Lakeland Book of the Year awards. Mark MacLean was born Ulverston, Lancashire (now Cumbria), and spent the first 20-odd years of his life in the village of Ireleth. He now lives in Lightning Ridge, New South Wales, where he works as a teacher at the Central School. Mark has written several books that usually combining his interest in place and identity.